As the pioneer in mini handheld keyboard mouse combo field, Riitek has many national patents and leads the field in development. The company makes policy per as market requirement, takes technology as the source of power, and cherishes its staff as the treasure. 'Innovation driving quality' is the core value for Riitek. Rii's industry-leading design and hardware are what you're looking for. 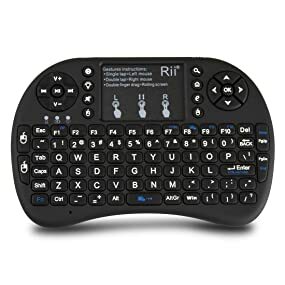 Rii's i8+ is the premier mini keyboard on the market. The keyboard includes a touchpad DPI adjustable functions and built-in high sensitive smart touchpad with 360-degree flip design. With a new classic look, the Rii Mini i8+ new increased LED backlit function can be used with LED lighting Qwerty keyboard with multimedia control keys and PC gaming control keys. 92-keys, allowing for multi finger functions. Touchpad for any mouse interactions for your PC or laptop. Ideal for set top TV boxes, gaming devices, and computers.